KA-BAR Knives USMC KA-BAR Straight Edge autographed by R. Lee "The Gunny" Ermey (R.I.P) PLUS another (unsigned) USMC KA-BAR to use! One for SHOW, One for GO! - PLUS Gunny's GLOCK G17 Gen5 with Gunny's Signature Laser Engraved on the top of the slide. **** Chosen by Winner: Byron B. Statement from Knife Rights Chairman Doug Ritter on the passing of R. Lee "The Gunny" Ermey on April 15, 2018: The Gunny was an incredible human being, one of the warmest and nicest gentlemen you'd ever want to meet. I will cherish having known and worked with him. He was a true patriot and a staunch Knife Rights supporter who said of this organization, "I whole-heartedly endorse the work of Knife Rights and support their mission! I detest the fact that such an organization is even necessary in the United States of America." He will be sorely missed. 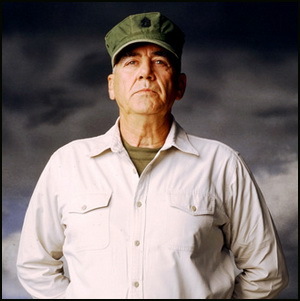 Semper Fi, Gunny. Rest in Peace. I can’t think of a more fundamentally useful, basic tool in existence today than a good quality knife. Invented and used by primitive man, it is one of the few tools from the Stone Age that is still in use today. A good knife is a must have in any emergency survival kit worth it’s salt. No one in their right mind would go camping, hunting or fishing without a good sharp blade or two on his belt and in his pocket. How would we clean or trim our nails? Restricting the rights of Americans to carry and utilize knives would rank right up there on the dumb scale with restricting the use of other tools such as hammers and wrenches. I would like to know who the Alfred E. Neuman think-a likes are who come up with these ridiculous ideas. Whoever they are, we do need to keep sharp objects out of THEIR reach. I whole-heartedly endorse the work of Knife Rights and support their mission! I detest the fact that such an organization is even necessary in the United States of America. USMC KA-BAR, Straight Edge ($104, Gunny's autograph, PRICELESS) autographed by R. Lee "The Gunny" Ermey PLUS another USMC KA-BAR ($104) to use! One for SHOW, One for GO! 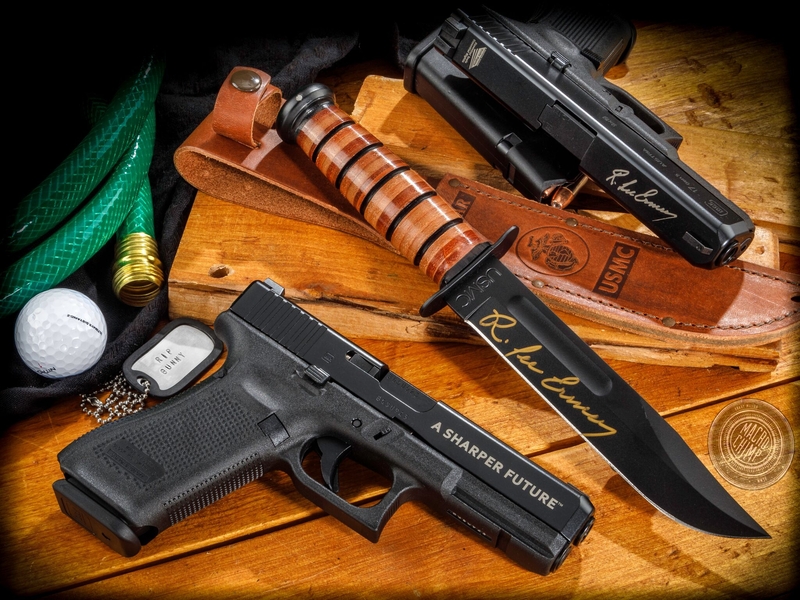 The most famous fixed blade knife in the World - "the KA-BAR" - was designed to serve our troops during World War II and is still doing its job, with honors, 70+ years later. Tang stamped USMC. Leather sheath with embossed USMC emblem included. 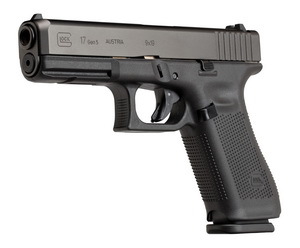 The GLOCK 17 Gen5 is the latest example of GLOCK's constant pursuit of perfection. The latest version of GLOCK's original model features over 20 design modifications from the G17 Gen4, including the GLOCK Marksman Barrel, an nDLC finish, ambidextrous slide stop levers, a grip with no finger grooves, and a flared mag-well. These changes deliver improved accuracy, durability, performance, control, and flexibility whether you are on the range or in a situation where fractions of a second matter. Gen5 pistols will be available with a variety of sight options, including standard, GLOCK Night Sights (GNS) and BOLD. Length (overall): 202mm / 7.95 in. Width: 34 mm / 1.34 in. Pistol Loaded: 910 g / 32.10 oz. NOTE: This GLOCK G17 Gen5 is not CA or MA compliant.